an unpaired compound gland suspended from the base of the hypothalamus by a short extension of the infundibulum, the infundibular or pituitary stalk. The hypophysis consists of two major divisions. The first, the neurohypophysis, comprises the infundibulum and its bulbous termination, the neural part or infundibular process (posterior lobe), which is composed of neuroglialike pituicytes, blood vessels, and unmyelinated nerve fibers of the hypothalamohypophysial tract. The cell bodies of these axons reside in the supraoptic and paraventricular nuclei of the hypothalamus. These fibers convey to the lobe for storage and release the neurosecretory hormones oxytocin and antidiuretic hormone. The second division, the adenohypophysis, comprises the larger distal part, a sleevelike extension of this lobe (infundibular part) that invests the infundibular stalk, and a thin intermediate part (poorly developed in humans) between the anterior and posterior lobes; the anterior lobe consists of cords of cells of several different types interspersed on the secondary capillary bed of the hypothalamohypophysial portal system. Secretion of somatotropins, prolactin, thyroid-stimulating hormone, gonadotropins, adrenal corticotropin, and other related peptides in the adenohypophysis is regulated by releasing and inhibiting factors elaborated by neurons in the hypothalamus that are taken up by a primary plexus of capillaries in the median eminence and transported through portal vessels in the infundibular part and infundibular stem to a secondary plexus of capillaries in the distal part. A small oval endocrine gland attached to the base of the vertebrate brain and consisting of an anterior and a posterior lobe, the secretions of which control the other endocrine glands and influence growth, metabolism, and maturation. Also called hypophysis, pituitary body. an endocrine gland suspended beneath the brain in the pituitary fossa of the sphenoid bone, supplying numerous hormones that govern many vital processes. It is divided into an anterior adenohypophysis and a smaller posterior neurohypophysis. The anterior lobe of the gland is composed of polygonal cells related to the production of seven hormones. The hormones, controlled by hypothalamic releasing factors, include growth hormone (somatotropin), prolactin, thyroid-stimulating hormone, follicle-stimulating hormone, luteinizing hormone, adrenocorticotropic hormone, and melanocyte-stimulating hormone. The posterior lobe is morphologically an extension of the hypothalamus and the source of vasopressin (antidiuretic hormone) and oxytocin. Vasopressin inhibits diuresis by promoting nephron water reabsorption and raises blood pressure. Oxytocin stimulates the contraction of smooth muscle, especially in the uterus. Also called hypophysis, hypophysis cerebri. See also adenohypophysis, neurohypophysis. An unpaired compound gland suspended from the base of the hypothalamus by a short extension of the infundibulum, the infundibular or pituitary stalk. It consists of two major subdivisions: 1) the neurohypophysis and 2) the adenohypophysis, comprising the larger distal part. 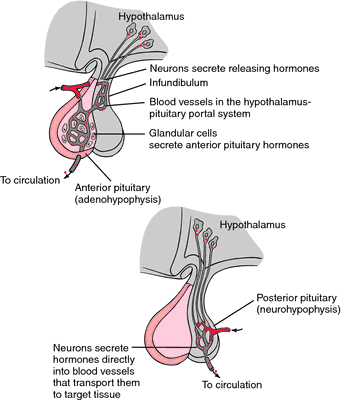 The pituitary gland is sometimes referred to as the "master gland." As the most important of the endocrine glands (glands which release hormones directly into the bloodstream), it regulates and controls not only the activities of other endocrine glands but also many body processes. endocrine gland at the base of the brain, attached by the pituitary stalk carrying blood vessels and nerve fibres from the hypothalamus. See also anterior pituitary, posterior pituitary. Unpaired compound gland suspended from base of the hypothalamus by a short extension of infundibulum; the infundibular or pituitary stalk. n an endocrine gland suspended beneath the brain in the pituitary fossa of the sphenoid bone. It produces a number of hormones essential for growth, metabolism, reproduction, and vascular control. Examples are: insulin from the pancreas, cortisol and adrenaline from the adrenal glands, oestrogen and progesterone from the ovaries, pituitary hormones from the pituitary glands, thyroid hormones from the thyroid gland and testosterone from the testicles. To test the therapeutic potential of this approach, the researchers transplanted the stem cell-derived pituitary cells under the skin of rats whose pituitary gland had been surgical removed. GH deficiency is very common in SS because somatotrophs are located in the lower and lateral regions of the pituitary gland and are most likely to be damaged by ischemic necrosis of the pituitary. Case 112: Pituitary stalk transection syndrome with ectopic posterior pituitary gland. Conclusion: Magnetic resonance imaging of pituitary gland was not associated with serum prolactin levels in patients with clinical suspicion of pituitary abnormality. 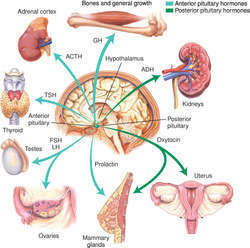 Growth hormone (GH) release from the pituitary gland is stimulated by GH-releasing hormone and is inhibited by somatostatin. Because the pituitary gland controls the sleep/wake cycle, some dogs remain "sleepy" for longer than that. The more common of the two cancers is a tiny, benign, slow-growing tumor (microadenoma) in the pituitary gland. 8 pg/dL after low-dose dexamethasone suppression test (LDDST) and radiological examination showed no adenomatous residue in the pituitary gland except for the former cystic lesion. 8 in the journal Cell Metabolism, shows that the pituitary gland actively responds to chronically high insulin levels, triggering a cascade of hormonal changes that disrupt ovarian function and impair fertility. They cover pituitary cell development and organization in adults, genetics, research topics, therapies, tumorigenesis, prolactinomas, growth hormone and acromegaly, the role of estrogens in the remodeling of the anterior pituitary gland, alcohol-induced hyperprolactinemia, gender differences in tumors, carcinomas, testing growth hormone deficiency in adults, imaging, the hypothalamic-pituitary-adrenal axis, Cushing disease, and other topics.